The roof of your home might be something that doesn’t cross your mind often unless something bad happens. When a tree branch falls on your roof, when there is a significant storm, when you are selling your home; these are times when you wonder what is going on with your roof. However, more could be happening with your roof than you may imagine. 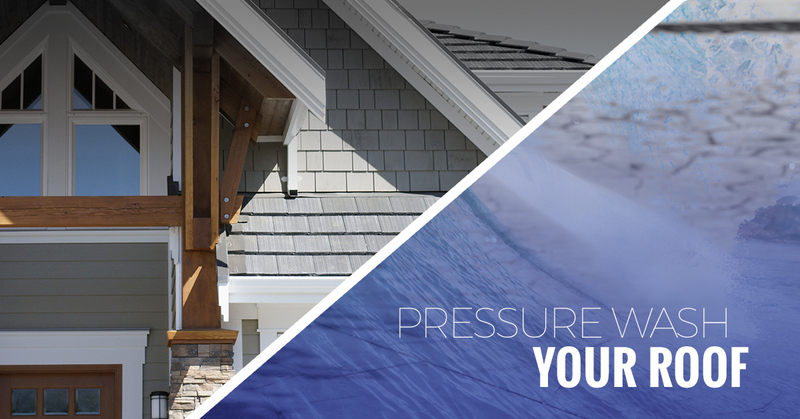 Storms, trees falling, and humidity can all have an impact on your roof without you even noticing. Power washing your roof can prevent damage that may occur after storms or over time. Many wonder why it’s important to pressure clean a roof when most of the time no one sees it. Most of the time, though, damage to a roof will occur over a period of time, as the roof ages. Read other reasons why you should pressure wash your roof and contact Palm Beach Pressure Cleaning for a free estimate on cleaning your roof. Many organisms live on your roof and feed off of the organic material in the shingles. Algae, lichens, and moss are all organisms that live and continuously cause damage over time. If they are allowed to stay and continue feeding off of your roof, the worse the damage will be. These same organisms can also cause mold to grow which in turn, causes wood rot. When wood begins to rot, moisture is able to get in, creating mold. Mold is not only not pretty to look at but is dangerous to your family and anyone living inside the home. Mold damage can affect the entire home, not just the roof. Insurance companies are more frequently requiring dirty roofs to be cleaned and can revoke an insurance policy if a cleaning doesn’t take place. What may start out as just a stain, could turn into replacing the entire roof or could cause damage to the whole home, which could cost the insurance company money. It may sneak up on you, but mold growing on your roof will eventually be noticeable from the curb. Mold or moss will age a home significantly, giving the entire house the appearance of being unkempt. When a home’s roof is covered with algae, it is less efficient in reflecting sunlight. The shingles on your roof will actually absorb heat from the sun, which causes an increase in cooling costs. If a roof is not pressure cleaned regularly, organisms will grow and cause severe damage to your roof. This damage can be severe enough to the point that an entirely new roof will need to be installed. A new roof, depending on the surface space and materials, could cost up to $10,000. When you contact Palm Beach Pressure Cleaning, you can get an estimate for power washing your roof. With this estimate, you can calculate how much money you can save by pressure cleaning now, rather than replacing your entire roof later. Our team of pressure cleaners is dedicated to giving your home a fresh look that will not only improve curb appeal but will also add years to the life of your roof. Contact us today!